This summer is going to be our year to make it to a drive-in. But since there isn't a drive-in near where we live, I'm scouting out all the drive-in possibilities near where we might be going, so we could bundle a movie into a visit to grandma, or a road trip. Then, as I'm doing it, I've been finding places I just have to include, because they're too awesome not to. Warwick Drive-in: This is just off of Hwy 17, so it's easy to stop at on the way to the Catskills. 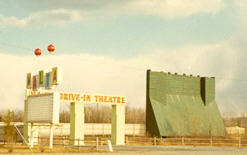 Circle Drive-in in Scranton, PA. We drove by this once, and it looked really kept up. Elmira Drive-in: Southern tier of NY, near-ish to the Finger Lakes. Fairlee Motel and Drive-in: their website says it's only 1 of 2 motel/drive-in combos in the country. It was built in 1950, and is close to I-91 in Fairlee, Vermont. I love the menu which is simple burgers and popcorn, but the beef comes from their NH farm, the butter is Vermont Cabot, and their onions and fries are Brew City. About an hour into my research, I found the definitive site on drive-ins. The only problem is, it's a little sad and reads like an obit column, as so many are gone. But, you can look up by state and find what still exists. There's a great one in Wellfleet on Cape Cod. In college, my friends and I would mix up a batch of cookie dough, and go see a drive-in...so wild and crazy! I really like your blog, and followed some of your pointers for an overnight to Philadelphia...so thank you for that! The one in Wellfleet has the extra added bonus of a flea market during the day on weekends. Plus it's on Cape Cod so how bad could a trip there be?